Dr. Shahnam has a B.S. in Mechanical Engineering from University of New Haven, with an M.S. and Ph.D. in Mechanical Engineering from West Virginia University. He is a research engineer at the Computational Sciences & Engineering Division of Department of Energy, National Energy Technology Laboratory. He is presently involved with characterizing uncertainty associated with CFD simulations of reacting multiphase flows, such as a coal gasifier. 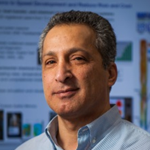 Dr. Shahnam has over twenty five years of experience in the areas of numerical simulations, multiphase flows, heat transfer, combustion, propulsion, laser diagnostics, and fluid flow systems. He has been involved in modeling combustion and gasification of coal in gasifiers, solid oxide fuel cells, CO2 capture using sorbent technology, dispersion of heavy LNG gas and engine knock simulations for Department of Energy National Energy Technology Laboratory, with over 50 journal publications and conference presentations. Musser, J., Syamlal, M., Shahnam, M., Huckaby, D., “Constitutive equation for heat transfer caused by mass transfer”, Chemical Engineering Science, Volume 123, 17, February 2015, pp 436-443. Li, T., Pannala, S., Shahnam, M., “CFD simulations of circulating fluidized bed risers, part II, evaluation of differences between 2D and 3D simulations”, Powder Technology, Volume 265, October 2014, pp 13-22.